I have been the opposite of adventuresome in the kitchen lately. I’ve been adventure-less-than-some. Adventure-if-you-eat-a-salami-sandiwch-one-more-time-you-will-turn-into-one-some. The immediate issue is that when I get home from school the last thing I want to do is cook. I used to say it was relaxing, but I think that was when I had some semblance of free time or during finals where anything not involving a book was the greatest thing ever. I actually looked forward to doing laundry, and anyone who knows me knows that is ridiculous. Anyway, I’m usually a total schmuck when it comes to dinner so I am pretty jazzed to share with you all this super-easy and super-delicious dinner. This is something that I actually make fairly often because it comes together quickly but is still more filling than a sandwich. As much as I love sandwiches, I always feel like I get short-shrifted when I eat one for dinner. I don’t know. I’m weird. I usually make this without the shrimp (might even prefer it that way) but you can’t deny the protein-nutrient-punch that the little crustaceans provide. Also, it makes it look prettier in a picture! So anyhoo, make this and you can get a taste of what eating in the Tip Top Shape kitchen is like! All you need for the full experience is to add a cookie, some wine and a chronic lack of napkins! I really should buy some napkins. Boil water in a large pot and add the soba noodles. Boil for 5 minutes and then rinse and drain in a collander. Heat 1 tsp of oil in a medium sautee pan and add the shrimp. Sautee until cooked through, 3-4 minutes. In a blender mix together the peanut sauce, soy sauce and water. I didn’t measure this because it’s really up to your preference in how thick or thin you like the sauce. I typically err on the side of more peanut butter because I like a strong taste. Regardless, the technique for the sauce is pretty standard. If it’s too thick add more water. If it’s too thin add more peanut butter. Bada boom. Combine all the noodles, shrimp, sauce and pea pods in a bowl. Serve at room temperature. My mind is a hot mess right now. A HOT MESS, you hear?! Classes start tomorrow and in between buying books, reading said books and planning lunches for the week – which I forgot is really difficult, I don’t know how moms do it – I finally have a minute to sit down and blog. Which then of course leads to me spending a long time staring at a blank page because nothing really exciting has happened in the past few days since my last post, and I sort of misplaced my camera and can’t figure out how to get my pictures from Instagram on here. I swear I followed the step-by-step and this site just responded by giving me the bird. And by giving me the bird, I mean only a link appeared and not the picture. So, I’m doing what I always do when I can’t think of something to post. I went back to the old Tip Top Shape (over on Blogger) and pulled up one of my favorite recipes to share. I was all excited to share a cookie recipe. Because, let’s face it, nothing is really more exciting than that over here. But then I came upon this tilapia recipe and before I knew it I hopped back here and began typing the title. Just the name makes my heart go pitter-patter. The thing that I love about tilapia is that it is literally the easiest thing to make. Just thaw it, bake for about 15-20 minutes, and you have this amazing and healthy dinner. This is the perfect weeknight meal. It’s simple and elegant. Preheat oven to 400 degrees. Place a cooling rack (like you would use for cookies) on a cookie sheet and set aside. If defrosting the tilapia, place in a strainer and run cold water over the filets until thawed. Pat the filets dry. In a small bowl, beat the egg and set aside. In another bowl, mix together the breadcrumbs and parsley. Dip the tilapia in the egg, shaking off any excess, and then dredge in the breadcrumb mixture. Place the filets on the cooling rack and slide the baking sheet in the oven. Bake for 15-20 minutes. Finish off with a squeeze of fresh lemon juice. What’s your favorite weeknight meal? This is another recipe repeat from the old blog. But I figure that since half of you are new to here (hello law lovelies! ), you won’t mind too much. For the other half (hello to you, too!) please just bear with me for this one post. Think of it as a reminder to make this. Because really, you should make this. I love to add leftover meat to salads. It adds a lot of flavor to a salad and ensures that I don’t end up wasting leftovers. This was steak that my grandpa made on his charcoal grill over the summer. I am obsessed with that charcoal grill. It’s this really small and old grill that I’m pretty sure he got from some garage sale in the 90s. It takes twice as long to cook the meat as a propane gas grill would, but the cuteness factor wins out. Plus, it gives me more time to be outside with him just talking and drinking wine. Yeah, I’ll take the charcoal over propane gas grill any day. You don’t need to have charcoal grilled stake for this, obviously, but it wouldn’t hurt. And if you can add a grandpa and homemade wine – that wouldn’t hurt either. 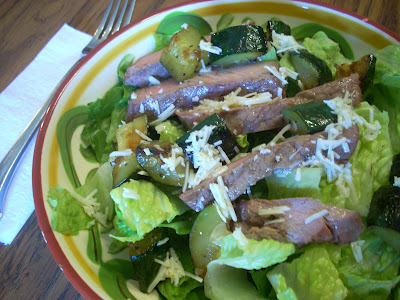 I paired the steak with some sauteed zucchini and romaine. The dressing is a really simple lemon viniagrette with parmesan cheese. The steak pairs beautifully with the buttery zucchini, and make sure to load on the dressing! It definitely makes the salad! I’m putting more winter friendly directions here for cooking the steak. Leave the charcoal grills for the summer! Heat a grill pan over medium heat. Season the filet with salt and pepper on both sides. Place on the grill pan and cook roughly 5 minutes per side for a medium-rare steak. Set aside and let rest for 10-15 minutes. In a saute pan, heat oil over medium heat. Add the chopped zucchini and cook for 10-15 minutes, until tender. Set aside. For the vinaigrette, whisk together the olive oil and lemon juice until emulsified. Adjust the amount of each depending on how acidic you like your dressing. More lemon if you enjoy acidity, less if you don’t. Mix in the parmesan. Combine all of the ingredients and toss to mix.